Ever cooked something amazing and then struggled to find the recipe next time you wanted to make it? Actually one of the reasons I decided to start this blog back in 2005, was because I wanted to keep a record of what I’d been cooking. And stop losing my favourite recipes. I was reminded of this recently when I was contacted by a Stonesoup reader, looking for help with keeping her recipes organised. So today I thought I’d share my current recipe organisation system. It’s a constantly evolving process – so if you have any suggestions, I’d love to hear them. Whenever I’m testing recipes or just playing around and come up with something really great – I write it down in my current moleskine notebook. Not exactly searchable but better than forgetting. Having a blog and a cooking school is a great way to makes sure your favourite recipes are safely stored online. I have a recipe index but I find I use the search box in the side bar all the time. Feel free to adopt Stonesoup as your own free recipe resource or signup to the Virtual Cookery School to get access to ALL my recipes. Gone are the days of having scraps of recipes torn out from magazines and newspapers and dog-eared cookbooks. And forget about bookmarking recipes on blogs or even worse, copying and pasting them into a separate location. Get yourself an evernote account and you won’t look back. Anything I come across online, I clip into my evernote recipe file. I also have the Evernote app for my iphone so when I read a recipe in a cookbook, or magazine or on the back of a packet, I just take a photo and upload it into my Evernote account. And it gets even better. The evernote is able to search text in images as well as other files so there’s no need to organise your notes. A simple text search will find what you’re looking for, even if the recipe was uploaded as an image. Adapted from the talented Molly Wizenberg from Orangette. And I agree with Molly that these cookies are better when they’re cool. Straight from the oven they’re overpoweringly rich. I’ve made quite a few changes to the original so please feel free to check it out over here. Basically I found it’s fine just using one type of flour and one type of sugar. I did try simplifying the raising agents as well but the results weren’t as good as using both baking powder and bicarb soda. Be warned. These cookies are dangerously addictive. After all these years I finally ‘get’ why some people get so excited about cookies. I’m convinced these cookies can pretty much convert anyone. 1. Whizz butter and sugar in a food processor or stand mixer until light and creamy. Add egg and mix until well combined. 2. Add 3/4 teaspoon baking powder and 3/4 teaspoon bicarb soda to the flour and mix to combine. 3. Fold butter mixture into the flour until only just combined. 4. Chop chocolate into chunks and add to the dough. Cover and refrigerate for at least 15 minutes but no longer than 72 hours. 5. When you’re ready to bake, preheat oven to 180C (350F). Line 2 baking sheets or trays with baking paper. 6. Scoop 1/3cup balls of dough and place on the prepared trays. Allowing room for them to spread. Sprinkle liberally with sea salt flakes. 7. 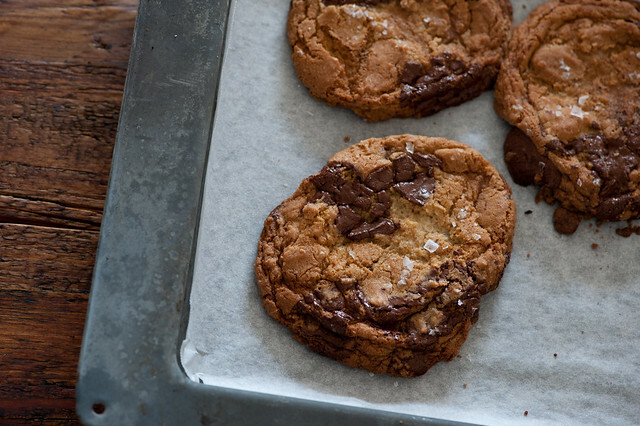 Bake for 15 – 20 minutes or until cookies are golden. The bottom tray may need a little longer. Cool on the tray. I love Evernote too, it’s great because I have a desktop and a laptop and travel a lot, so wherever I am I can access my notes – even on my iPhone. I recently started using it to gather recipes and I love that it is so easy to search, even images. I will be adding this to my list of recipes to try, love the sweet and salty combinations. I’ll have to check out Evernote but I have the problem that I collect some great seasonal recipes from friends, food co-op, or family and then forget to use them. Then I get into a recipe rut. So I organized them by seasons in two binders- fall/winter and a spring/summer. This way when fruits and vegetables are available local I can just pull out the binder for those seasons to page through less recipes to find what I need. I even put them in a chronological order of how they grow in our area and in page protectors so I don’t get them dirty. Love the look of those cookies! I have a major recipe disorganization PROBLEM. It is a crazy mess and in about 4 different locations. ARG. I will look into Evernote. I love the cookies from the New York Times. They are my go to cookies, I will have to pair down the ingredients like you have and give it a whirl. @Stacy – The cool thing about Evernote is that you can organize recipes, etc by tags. So, just upload the recipes and tag them by season, and you can still browse through them that way. Yum. I need to make these pronto. I looooove chocolate chip cookies and these look divine and simple. Also, I just got an evernote account the other day and im in love. I love salt and anything sweet- my friends thought I was crazy 2 years ago; but now that salted whatever is everywhere I suddenly look like an innovator, lol- it’s nice! Evernote has been one of my favorite things for a couple years now. I’ve got over 1500 recipes stored in it and I use it all the time. I can’t imagine my life-or my cooking-without it. I even wrote about it: http://www.relishments.com/blog/2009/05/new-favorite-site-evernote/ (and I’ve mentioned it a bunch of times since then). Even with all the use, I’ve never had to pay for premium. Highly recommended. I use onetsp.com for my recipe storage. It is searchable by recipe name or tags or ingredients. If I have something in the fridge that I need to use I can search for a recipe by ingredient. You can also add a recipe to a shopping list. There is a mobile app, so I now have a paperless shopping list. Make these cookies this afternoon and they were fantastic. I made them smaller (got 25 out of the recipe) and subbed out half of the white flour for almond meal to give it a fuller flavor. Can’t wait to take them to the office tomorrow and hear the comments! I have a list of food types on a fortnightly rotation, eg, pasta, rice, roast etc so it is very basic and I have a file with each category on a sleeve and the recipes inside or notes on recipes in books. So in the morning or sometimes the night before I pull out the appropriate recipes have a nice browse , choose what will happen for dinner which is often a hybrid combo of more than one recipe and make a list if I need anything and thats it, easy peasy. Best thing I ever did. The ingredient list is so small for these cookies. I’m in LOVE! wait till you try them allison! and glad to hear there are lots of evernote converts already out there! I absolutely love Moleskine and Evernote! Moleskine actually makes a recipe journal now! It’s wonderful! Swoon! thank you for the evernote link. I’d never heard of them but wow, I will be using this great tool. I discovered Evernote recently and it’s hands-down my favorite tool for organizing recipes. I snap photos of recipes I clip from magazines (and then throw out the paper) and copy and paste online recipes right in. 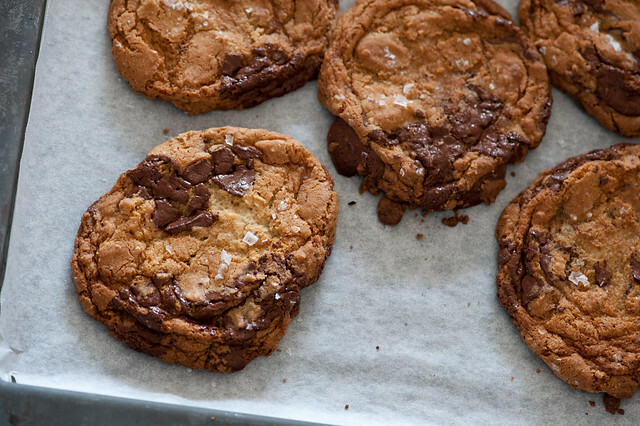 That’s just what I’m going to do right now, with this choc chip cookie recipe. Looks GREAT. Did you say salt? I’m in. These look AMAZING. I seriously have about 6 moleskins in all those important places (purse, kitchen, desk, bathroom…) They are the bestest of the best; as are miss Molly’s cookies. They look sensational! I didn’t know moleskine made a recipe journal – will have to check it out… although mine tend to get stuffed with everything.. to-do lists, recipes, notes, shopping lists, you name it. yes miss molly certainly knows a thing or two about cookies…. and I love that you have moleskines everywhere.. wonder if they’d ever make a waterproof one for the shower? I am thoroughly obsessed with Evernote. I use it to organize and categorize recipes, keep grocery lists and to-cook lists. I don’t know what I’d do without it! As soon as I read this I downloaded Evernote and saved this page on it. I’m still working out how to use it, but I’m eating one of the cookies from your recipe while I’m doing it and they are lovely. glad to hear you’ve made the cookies already amanda! I use a 3 ring binder with clear sleeves that you can slide paper copies into. My laptop always goes to sleep or ends up with flour on it and it drives me mad. I still clip recipies from magazines and print them from websites so I need something tangible. It’s also where I put my take-out menus and instructions for things like beans and pasta that I store in glass jars. I love it!!! so glad the cookies worked well for you! ohmygoodness….these are amazing. They look beautiful, crunchy on the top, soft inside. Incredible. When I made the recipe, I ended up with 9 large cookies. 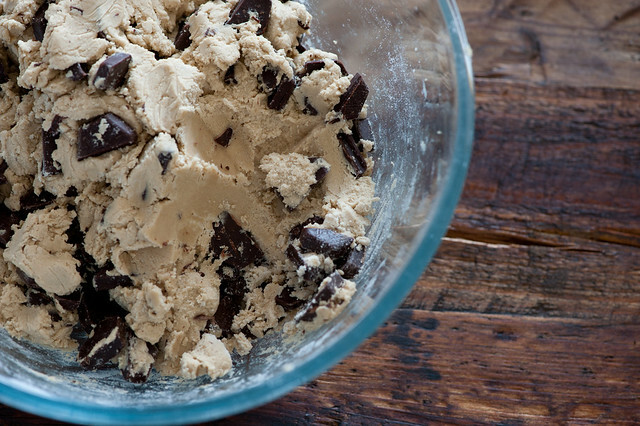 The 1/3 cup scoop of dough per cookie is not a typo…they are perfect. I made the cookies last night and they were wonderful! I salted half and left the other half unsalted (my friend with whom I was cooking was suspicious about the salt idea). We both ended up agreeing that they were better with the salt. Thank you sooo much for putting me onto Evernote, read this yesterday and immediately downloaded it. Love your blog. I know I’m a little late to the game on these, but these are definitely some of the best cookies I’ve ever made. Big. Ooey. Gooey. Love them. Oh! Did something terribly wrong or had a hard time with the measurement conversion to cups, etc… Mine look like greasy cow pies. Usually I do well with recipes but these came out to be truly sorry looking cookies for me. They don’t taste bad but just off, off, off all around! Any thoughts/suggestions? Would love to get them right as huge fan of salty/sweet and chocolate! Have you ever tried coconut flour Kara? I have the 3 ring binder too for all my recipes and I have a ton. Since I am a crafter and a rubber stamper, I am going to decorate the cover. I have stickers and stamps. Anyway, my family loves cookies and chocolate. When I bake, and I love to bake, my mom takes some to work for her boss and co-workers to try and then she takes them to knitting class so they can try them. I know my family will love these! It’s to bad my state says I can’t bake out of my house and sell them to people. And lovely to hear from a fellow baking fan! I just love to bake, but have never understood the idea of a “bitter”sweet chocolate! And then to add salt??? But I decided against my better judgement to make these last night. I will never look back! Thank you for this recipe, for encouraging us to step out our comfort zone and try new and exciting things! Yes, I love Evernote for recipes! I love having a searchable “recipes” notebook, and I also love the Evernote web clipper extension that lets me add recipes from virtually any site! I don’t especially enjoy cooking, but I find it necessary in terms of my fiscal and physical health, and Evernote makes it better. Isn’t Evernote the best MK!